Week 2 and phoned GBS to see if any of my back order items where in stock yet, and yes a few ! 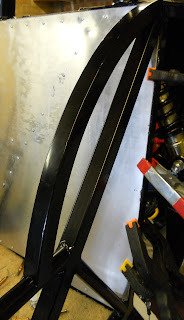 more important was the "black sticky bond stuff" was in stock, Jumped into the car, along with the bent bolts from last week and headed over to the factory. As usual when I arrived was offered a cuppa.... always goes down well ! This time Will sorted me out in the stores, swapped the bolts for straight ones, got 3 tubes of the black bond, a couple of brake discs and pads and 2 ball ends. While I was there a quick visit into the workshop to make sure I was doing things right, Craig spent a good 30 minutes going through the next stage of the the build with me, with another few good tips. Unfortunately for me I have to take part of the rear wishbone assembly apart to get a couple of washers in, This can be an IVA fail, so better to sort it out now instead of later which would involve more work. So back to the build, time to bond and rivet the rear seat panel on, already drilled and temporary in place from last week, Alex and myself removed the panel and put a good bead of bond around the frame and over the rivet holes, its really a 2 man job to make it easy, and a couple of minutes later the panel was back in place, stuck to the bond, located about a dozen rivets around the panel to make sure it was in the right place and started riveting. 15 minutes later, one back seat panel in place and riveted. Clamps placed on the 2 side parts as I was unable to get a drill in for rivets, but this black bonding stuff is pretty strong anyway, give it overnight to cure. Now onto the front foot well panels, drilled, bonded and riveted. Alex riveting, learning new skills every weekend ! Time for a break, and F1 qualifying is on. Also give time for the bond to go off, got about 40 to 60 minute working time with the bond and anywhere between 24 and 48 hours curing time. Top tip... When using the black bonding sticky stuff, use rubber gloves, or something similar, its taken several washes with a good hand cleanser, 2 showers, and a scrub with white spirit to try and get it off my hands and its still not off !! Managed to get it in my hair as well, and on my clothes... bloody stuff gets everywhere ! The side foot well panels need a bit of bending so in the "Workmate" Alex clamped the panel and gave it a bend. first time, and a perfect fit ! Before we set this panel in with bond and rivets, we'll put the gearbox mount in while we have space to work round, a bit of trimming with the angle grinder and 4 holes drilled and its in place centrally. The wiring loom was also placed in an approximate position, screwed to a piece of wood and clamped to where it will be placed on the scuttle (give or take a few Cm's). Brake master cylinder was also bolted in place ready for the brake lines. Every time I seem to bend over the frame, reach for something, or even walk past it, I catch the "black sticky stuff" its getting everywhere, so I'm going to stop for a while and go and watch the last race of the F1 series. Scrubbing time...1 hr and still not got the black stuff off !